One reason behind the Orthodox world having its own Easter date is a tradition going back centuries [rule set forth by the First Ecumenical Council, held in Nicea in 325 AD], which states the church must celebrate after the Jewish Passover to maintain the Biblical sequence of Christ’s Passion. When the Catholic and Orthodox churches separated in the 11th century, both churches calculated the date of Easter in the same way - by finding the first Sunday after the first full moon on or after the March Equinox. The other reason was, that the Catholic church adopted the Gregorian calendar in 1582 (Pope Gregory XIII decided that the calendar needed an overhaul because it was slightly inaccurate mathematically), and the Orthodox church continued to use the older Julian calendar. Even when the Julian calendar stopped being the civil calendar of Orthodox countries, the church continued to use it. Because the two calendars had a difference of 13 days by the 21st century, and because both churches use March 21 for the date of the vernal equinox [the date where we are exactly halfway between our longest daylight hours (June solstice) to our smallest (the December Solace)] instead of the observed equinox, the date of Easter is different in both churches. For purely astrological reasons, the difference between the celebration of Easter for the two denominations will be getting wider. 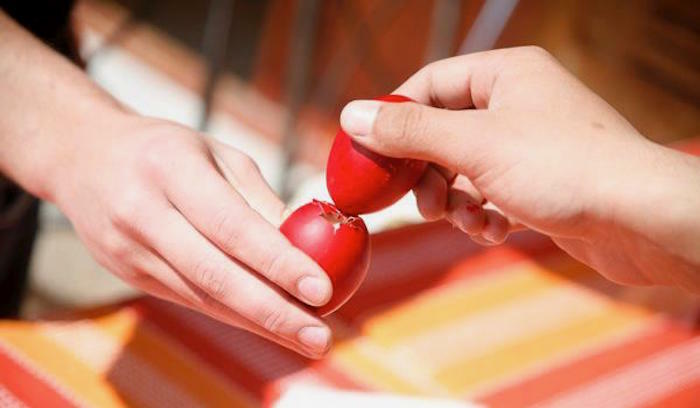 “Fun” fact, in the whole 21st century, the celebration of Easter will be common for 31 years, but every forthcoming century this will happen more and more rarely and from 2700 and on, the celebration of Easter for the Greek Orthodox Church and the Catholic Church will never coincide again. The lambada (decorated Easter candle) is traditionally given to children by their Godparents and brought to church to the midnight service [Anastasi] to be lit with a flame from the New Light, representing the light of Christ coming into the world. This represents the risen Christ, as a symbol of light (life) dispelling darkness (death). It is a custom of Orthodox Christians to take home the lit candle from this Service and to make the Sign of the Cross with it on their doors as protection against evil. Below are some decorated lambada I’ve made for our Godchildren throughout the years. Traditionally, all gifts given to the children at this time signify the new beginning Jesus gave us with His Resurrection. Of course modern times demand Godparents to keep up and gifts nowadays cover a variety of Godchildren’s “wants” and likes. Personally (meaning my husband and I), we like to gift items that will make our Godchildren - all 3 of them, siblings among themselves - learn something new, make them laugh, teach them to share and come together. But gifts are “just” items purchased. I like to make sure they have something unique, uncommon and personalized only for and to them, because this is the only way I can convey our love, care and affection for them as they live so far away from us. My way of doing just that is each year handcrafting and/or decorating their Easter lambada. Below are the Easter 2019 lambadas for our two Goddaughters and our Godson. Thank you for coming along for a little lesson in Greek Orthodox Easter history and tradition. Below are some other blog posts that may interest you. Give it a go! Also, you can subscribe here for new blogposts, announcements etc.